TOTAL RENOVATION WORK from October to March 2019 with the CLOSING OF THE RESTAURANT on 01 November 2018. We count on your understanding during this work and your presence at the beginning of 2019 to welcome you under the ibis Styles brand. 3* hotel with private parking, bar, swimming pool, airport shuttle, completely renovated and renamed ibis Styles Nice Cap 3000 Airport. 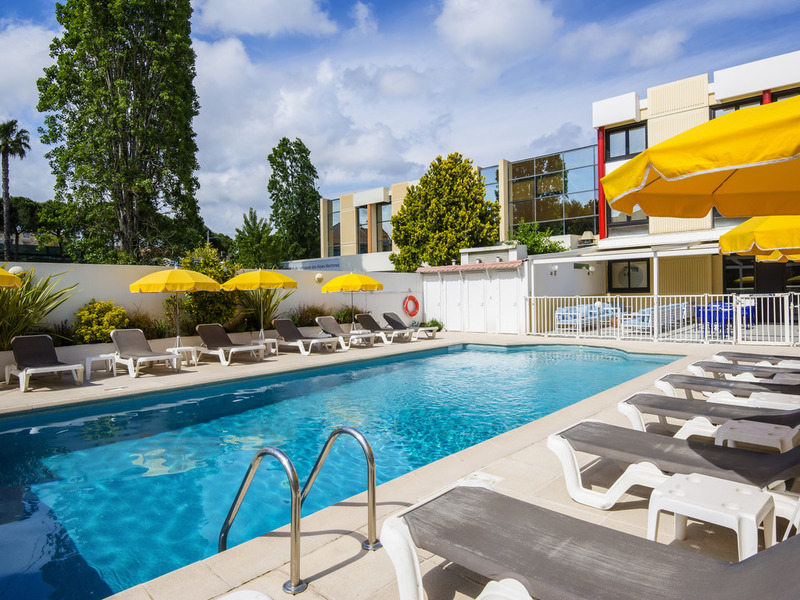 With a design inspired by shopping and Southern colors, the hotel is located opposite the CAP 3000 shopping mall, close to the beach, port of St Laurent du Var and 10 min from the Nice Airport. Easy access from the 49 highway exit, it is ideally located for a business or leisure stay, alone or with the family, with connected spaces and nearby activities. Located right in the heart of the French Riviera, explore Nice, Cannes and Monaco and also the numerous villages in the hinterland. Associate museum and festival visits to make the most of each moment during your stay. Airport shuttle from 6am to 11pm. Take a moment to relax in our comfortable, warm and cozy rooms, with decor inspired by the boating world. We only spent one night and were warmly welcome on arrrival. The restaurant was closed and a soup was made available hot for us. Mostly appreciated. From the moment I arrived, I was greeted by super friendly and helpful staff. I got dropped off at the hotel two hours before check-in, and the reception offered me a early check-in as a room was available. We where travelling with bicycles which the staff were happy to store for us in one of the offices. The hotel is conveniently situated close to the airport and directly opposite the shopping centre. Nice centre is a short train trip away. I would definitely stay here again on my next visit. The personnel was very nice and helpful. The stay uneventful, I enjoyed the swimming pool and the bar. The rooms are small and dated, but functional and comfortable . Some people were smoking in their rooms, which was not nice because it smelled in the corridor, but luckily not my room. 1.In the restaurant the need for a gluten menu was not understood even though we had advised in advance. 2. We were not allowed to choose from the full menu, only the specials. And the only gluten free offered was a salad - and a bread roll was offered. 3. The bar ran out of white wine, that really is a first for us - a French bar running out of wine. The worst Accor we have ever stayed at. Lovely tea in the room, great swimming pool, very lovely staff, nice comfortable bed and pillows, good facility to put suitcase on but really did not like the hand soap or the smell of the towels. Also, not enough clothes hangers ! Breakfast was too expensive for me coming from Australia (meaning the breakfast was 2x more expensive.) My stay was comfortable for what I needed at that time. Hopefully I will be able to return in the future. I travelled to France with my bike and your hotel very kindly looked after my bike travel case while I toured the country by bike. The staff were extremely helpful and very accommodating with my unusual request (bike case) as well as patient with my need to spend time in your garage assembling/dismantling my bike. I can only than them for their continued patience. The hotel itself is very nice - modern, clean and with some great facilities. The location is good for the airport, beach and Cap 3000 shopping centre - as well as quick access to the extensive cycle lane network. I would certainly recommend this hotel and, as a frequent visitor to Nice, I will more than likely book to use it again. Thank you. Have stayed at this hotel many times before and had a great stay as always. One issue this time the restaurant was closed on the Sunday night we arrived and finding a decent restaurant close by was difficult. It was a lovely stay, all made by the key location and the exceptional service ! All members of the staff are Brilliant . The only disappointment is the standard of the rooms. Tiny, no working space, no fridge . Nothing to compare with the Mercure hotels I am used to. the reception desk staff is very helpful, nice. The hotel is very nice, and the staff is exceptional, nothing is too much trouble. The location is ideal, 5 minutes drive from the airport, this is the best advantage. The rooms are tiny, no working space and no fridge. The sleeping quality is good, comfy bed and quiet environment despite the proximity of the airport. The plus is the swimming pool. The restaurant and bar are shut over the week ends...its a shame. The sea front nearby, as well as the shopping mall offer plenty of options to dine or have a drink, so yo wont starve . A lovely place, well managed by a very nice team, from reception to breakfast restaurant and cleaning staff. The room need definitely some improvement to reach the Mercure standard and its price. Enjoyed swimming pool. All personnel very professional. We appreciated the 'navette' service and luggage storage facility. Very good overall. Helpful staff with good advice the airport, fuel and food. My experience was as expected. The room was quite small, but just like Your web site. I was also very satisfied with the restautrant inlclusive the breakfast. The free Shuttle bus was also important for my Choice. Overall the stay at Your hotel was a good experience. Excellent value for money. Nice hotel, professional service, and good breakfast buffet. Covenient as located next to airport and train station. Would stay again when stopping in Nice. Excellent value for money. Good standard all round, professional service and very good breakfast buffet. Good location next to airport and train station. Highly recommend for short stay, not a stay-in hotel but excellent as a base to go from. Ecvellent service but tiny poorly maintained rooms. The staff were excellent, friendly, well organized. The hotel room was tiny even for Europe. 2 people had to coordinate movement in order use room. No outlets near bed on either side. Walls had unrepaired hole. Closet was virtually unusable due to placement and interior was unfinished. Breakfast had a good variety of food. Shuttle to airport was prompt. Fine for a one night stay only.